Blue turns green with a St. Patrick Day celebration on Saturday, March 17th! Get lucky with Happy Hour, Jameson specials, and Green Tea shot specials at all of our locations! We’ll also have specially priced food during happy hour, drink specials and bottle specials, and live music throughout the night. 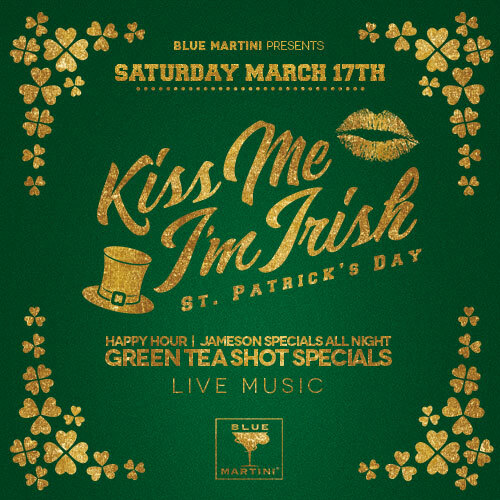 Call your Blue Martini location for VIP St. Patrick Day Party Reservations! On March 19, Blue Martini Lounge is having our 2018 Blue Martini Invitational Golf Tournament at Fort Lauderdale Country Club to raise money for the non-profit organization, A Prom to Remember. This is the 8th year in a row that Blue Martini is partnering with the non-profit to raise funds. This wonderful charity organizes a prom for local teens with cancer. The funds we raise at the tournament will go towards dresses, tuxes, limousines, hair, makeup and the special extras at the prom, which will take place at the Ritz-Carlton Fort Lauderdale on May 11. For information on participating in or sponsoring the Golf Tournament, please visit our site at https://fortlauderdale.bluemartinilounge.com With several locations in Florida as well as Arizona, Las Vegas, and Texas, Blue Martini Lounge strives to be involved with our community. For a complete list of locations, and to find out more about Blue Martini, click through our website.